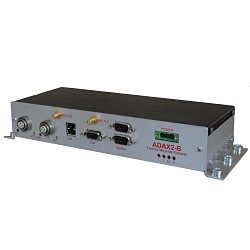 The ADAX2 GSM Data Logger has been designed for monitoring and recording information in road and rail transport applications. It is a self-contained unit capable of receiving a variety of data streams over a wide range of interfaces and then storing the data in an onboard Compact FLASH device. A typical application might involve collecting signalling and onboard systems data in a high speed train, and then downloading the data to a remote workstation via GPRS. The unit can also be specified with a GPS interface, which allows it to record its position at all times (ideal for signalling testing or wagon pool applications). If an alarm condition is detected (e.g. on one of the digital IO lines) then the unit can use the GSM/GSM-R interface to generate an SMS message to alert a remote operator. The Data Logger power supply accepts 9-48V input level which combined with the wide operating temperature range makes it compatible with many transport applications. The ADAX2 (which is EN50155 certified) is based on an Intel PC architecture, which allows it to run a standard Linux OS and be programmed using standard software tools.